Shapoor N. Bhedwar, Tyag No. 4: The Mystic Sign, ca. 1890, black-and-white photograph, 10 1⁄4 x 13 1⁄2". A MELANCHOLY YOUNG WOMAN sits on the steps of a crumbling building, a pile of glistening fruit beside her. The folds of her white robe seem to glow. Do her garments symbolize purity? Is she a representation of the chaste goddess Diana? Instead of a toga, though, the snowy fabric swaddling her looks suspiciously like a saridraped in the Gujarati style favored by the Parsi community in Mumbai. Shapoor N. Bhedwar’s Fair Fruitseller, ca. 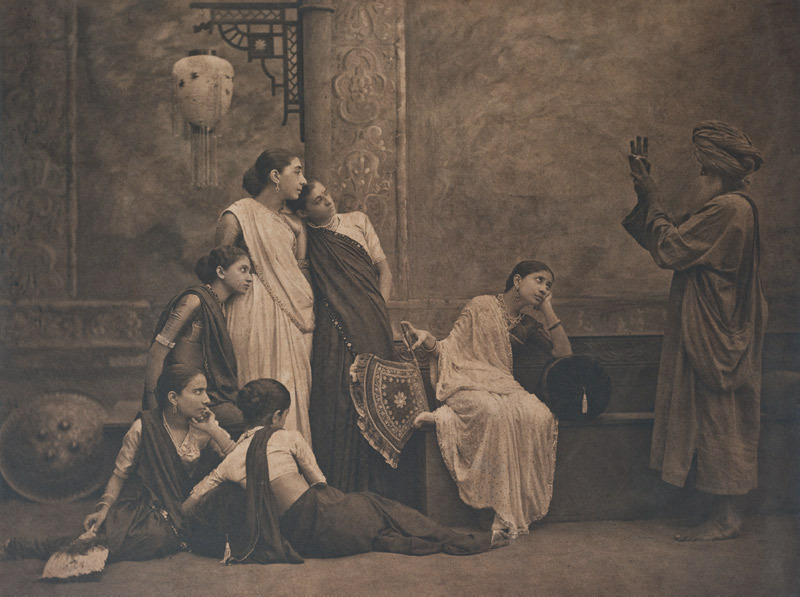 1890one of the photographs included in the recent exhibition “The Artful Pose: Early Studio Photography in Mumbai, c. 1855–1940,” at the Dr. Bhau Daji Lad Mumbai City Museumresonantly attests to the (often hilariously) hybrid nature of early photography in India.